President Jacob Zuma, on the 12 of May 2010 announced the appointment of the Presidential State Owned Enterprises (SOEs) Review Committee to review the role of SOEs in the country. The appointment of the Review Committee is a response to the acknowledgement that there is a need to strengthen the role of SOEs to ensure that they respond to a clearly defined public mandate and support the developmental state aspirations of government. Holds a BA (SW) degree from the University of the North, a BA (SS) Hons from Unisa, an MA (SS) degree from the University of Johannesburg and a Post Graduate Diploma in Business Administration from Wales University. Also attended Executive Development Programmes at the National University of Singapore and Wharton University, Pennsylvania in the US. Previously chairperson of the Presidential State Owned Enterprises Review Committee, appointed by President Zuma to lead the committee appointed to review SOEs. A past Group Executive for Absa Bank Limited. Also Group Executive at Transnet. She is a Member of Council for the University of Limpopo. She is a trustee of various NGO’s including Southern Africa Trust and The Nelson Mandela Children’s Fund. She chaired the Road Accident Traffic Management Corporation Task Team appointed by Minister Ndebele, the Minister of Transport. 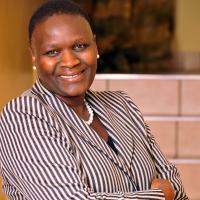 At Absa she chaired the All Pay Boards For Gauteng and Eastern Cape. She was board member for the 2010 Bid Committee and was Commissioner for the Road Accident Fund Commission. Riah holds an MA degree from RAU and a post graduate diploma in Business administration from Wales University.She also attended Executive development programmes at the National University of Singapore and Wharton University, Pennsylvania in the US.